Those of you in the east of England can enjoy some serious sounds this Saturday evening at THE SWAN in IPSWICH. 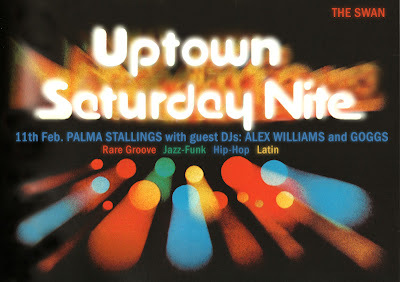 PALMA STALLINGS is running thangs for the night along with ALEX WILLIAMS and GOGGS also on deck duties. You can expect some heavy rare groove, funk, jazz, latin and hip hop beats at the first installment of UPTOWN SATURDAY NITE.